Wow, it feels like forever ago since I posted my last recipe. What has happened to me? I know what it is - I've been eating out and eating Lean Cuisines. Complete opposites, I know. When I turned on my stove today, I seriously couldn't remember the last time I cooked. How pathetic is that? I love to cook - what's wrong with me? To be completely honest, I haven't been feeling very inspired lately when it comes to food. I've been tired, a little stressed, time-crunched and a bit lazy. So in the past few weeks, I lost my cooking zen. But then I found this little beauty of a recipe on Pinterest, and simply could not resist. This pin literally made me get off my couch and head straight for the kitchen (it did help that all of this took place at 6 p.m.) Luckily, I had all of the ingredients on hand. 30 minutes later, I was in cooking heaven. And I got my zen back. If you're looking for something quick, easy (and delicious) to make this week (and have leftovers for a few more days), you've gotta try this recipe. Seriously. Not to mention, if you like buffalo chicken, this dish was made for you. *Note: I added a bit of ranch for dipping - old habits die hard. 1. Rinse and drain quinoa. Place in pot and bring quinoa and water to boil. Once boiling, reduce heat and simmer until water has absorbed. This should take 15-20 minutes. 2. 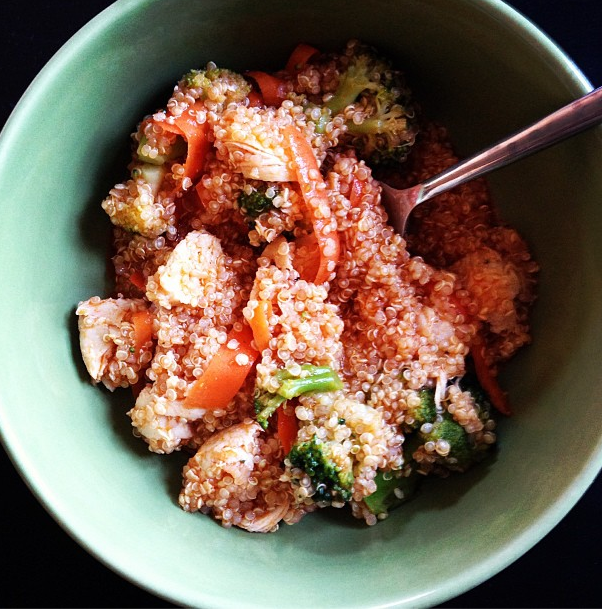 While quinoa is cooking, cook chicken in a skillet. Add seasoning salt to taste. 3. While the quinoa and chicken are cooking, pour olive oil and buffalo sauce into mixing bowl. Add seasoning salt. Stir. 4. At the same time, place broccoli and carrots in a separate skillet. Add seasoning salt (to taste) and a tablespoon of olive oil. Once veggies are crisp, remove from heat. 5. When quinoa, chicken and veggies are cooked, remove from the stove and mix in one bowl. Add sauce and stir.